You've narrowed your choices to two new cars, but you can't seem to decide which one is really the better deal. The purchase price of each car is nearly the same. The features are similar, and you like the way they both look. Still, a nagging feeling tells you that there must be a meaningful difference between them, even if it's not readily apparent during the purchase process. Your intuition is right on the money. And now there is a new tool that reveals the hidden costs — all the costs — associated with buying, owning and operating a car over a five-year-period. It's called True Cost to Own. The Edmunds Inc. 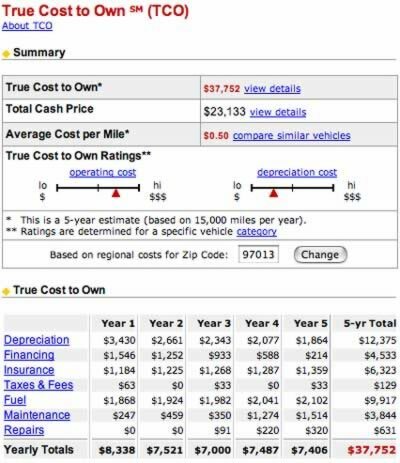 True Cost to Own pricing system calculates the additional costs you may not have included when considering your next vehicle purchase. These extra costs include: depreciation, interest on your loan, taxes and fees, insurance premiums, fuel costs, maintenance, and repairs. There are 14 reader responses to "Edmunds True Cost-to-Own Calculator". I’m never comfortable with including depreciation in cost-of-ownership of cars, simply because I have no intention of selling until it’s basically totaled. So, yes, I’m ‘losing’ potential money by not selling my car right now, but for my purposes, that’s a moot point. Great calculator. I watch people spend incredible amounts on auto expenses, completely unaware of how much it all adds up to. Personally, the last vehicle purchase I made was on a nice low-mileage-slightly-used model… 10 years ago. I’ve cared for it well and it still looks fantastic. I have no doubts that my savings on autos has contributed substantially to my millionaire status. Super cool tool. I was surprised that the depreciation (at least on the example) wasn’t higher during that first year of use on the new car. One always hears about how much is lost the second you drive the new car off the lot, wasn’t quite as dramatic as I thought it would be. I buy cars older than this thing allows! What about the TCO for cars 10years old and older? I also use this calculator to guesstimate how much we save by taking public transportation. When you’re taking the train (e.g. commuter trains), it seems to be expensive, so knowing the actual car cost helps a lot. Or how much we should be chipping in for carpooling. Wow. This calculator is really way off. I guess I can’t really argue with the numbers on new vehicles aside from the financing (though I can make guesses on insurance, and Edmund’s numbers are perhaps twice what I’d believe I pay). I ran a couple of used vehicles (it only goes back to 2003) and insurance, maintenance, and repair costs were off by a factor of as much as 5x. I guess it works okay to get a general feel for which car costs more. But I know the numbers are way off. I pay less than half per year to insure my car than it was saying (And I have good coverage). And I always pay cash. And like Ben says, depreciation isn’t really a factor since I will drive this car forever. Are you an older female with a good record or an 18 year old male with a speeding ticket? Insurance rates probably vary by an order of magnitude. You could probably spend twice as much just by not shopping around. Personally, I wish they spelled some of this out on the car window at the dealer’s lot. At least it would be easy to give people some sort of standardized “fuel costs per year” like they do on energy star appliances. I can calculate it myself — but I don’t think many people consider the deferred costs of ownership when the purchase a car. My car is 20 years old this year, and it’s still going strong. It’s actually gone up in value since I had it, by about 30%! I have always bought used Honda Accords and never had to add more than one battery, one set of brakes, one set of tires and one muffler and about 3 oil changes, one or two winshield wiper replacements over the 10 years I have it. I get at least ten years out of each of my cars, so the list was way off for expenses for Honda Accords. So I am not too sure about the calculator. The calculator only goes 5 years out. If you keep the car longer than 5 years the cost of ownership reduces substantially for each year beyond the 5th year. Buy the same car in its 6th year, pay cash for it and only carry the minimum required insurance and your cost will drop dramatically. I don’t think this sort of thing is very useful. The depreciation, financing, taxes and fees, maybe. Fuel costs? Maintainence? Repairs? Insurance? So many factors affect those. How many miles do you drive in a year? Are those mostly highway miles or mostly stop-and-go traffic? Stop-and-go is a LOT harder on your car than highway driving, and highway driving generally uses less fuel. How hard do you drive your car? If you drive like Juan Manuel Fanigo, you are going to be wearing out tires, clutches, brakes, and so forth a lot faster, and putting more stress on suspension components. Do you have a lead foot? The faster you drive, and especially the faster you accelerate, the more gas you use per mile. What is your driving record like, and to which demographic do you belong? A 19-year-old male college student with a speeding ticket or two and an accident on his record will have significantly higher insurance rates than a 50-year-old elementary school teacher with a clean record. What is the climate like where you live? Do you have to deal with a lot of cold weather? Cold weather is hard on batteries, and cold starts are hard on your engine, not to mention road salt, increased likelihood of fender-benders, and so forth. Do you have to deal with a lot of hot weather? Hot weather is hard on your car too. If you are buying used, you have to look at the former life of the car. Has it been sitting in a garage for the last 5 years, never driven, with all the seals drying out? Did the former owner drive it hard? If you are looking at non-local cars, is it in Wisconsin or California? The former has seen road salt, cold starts in the winter, and so forth, but that’s no guarantee it will be in worse shape than the California car. Years of stop-and-go LA driving may have taken more of a toll on the car than a few long trips to Duluth. Some things are “fixed” costs. They will be more-or-less the same for anyone who drives the car. Other things, like those listed above, are variable costs. This calculator brings so many variable costs into the equation that the numbers are almost meaningless in real life. I think Adam has a lot of good points about variable costs. Because of those, I don’t think the tool is good for predicting how much it will really cost you over five years, but it’s still a very valuable tool for doing comparisons. Most of the factors apply to whatever car you end up buying, so they pretty much cancel out. For instance, if you use twice as much gas as they assume in a Honda Accord, you’ll probably also use twice as much gas in the Jeep Grand Cherokee. Edmunds True cost to Own seems to be in the ballpark with the average insurance and fuel costs. But the Maintenace and Repair costs vary wildly. Edmunds estimate one luxury SUV at around $9900 over 5 year life of the car for repairs. But another site for the same vehicle model and year is saying only $2200. Some of these numbers they just make up out of thin air. Now theres now way of telling what could wrong with a car but its rather strange.